The Stoke Farm Reformatory for Boys was founded by Quaker politician and social reformer, Joseph Sturge, who had previously instigated a similar institution at Saltley. In 1853, Sturge, in co-operation with his brother Charles, bought a farm at Stoke Prior (or Stoke Works), sixteen miles from Birmingham, and extended the buildings with dormitories, school rooms and workshops. As at Saltley, Sturge's initial intention was to find suitable boys on an informal basis, working in co-operation with the police and other organisations. However, following a request from Worcestershire magistrates, he agreed to receive boys who had been been convicted of a criminal offence, as an alternative to their going to prison. On December 9th, 1854, the premises were officially certified to receive up to 50 boys, aged from 10 to 15 years, who had been sentenced by the courts to detention. Joseph Sturge took a close interest in the School, sometimes sleeping on the premises and getting to know some of the boys personally. He also employed a much less severe system of discipline than usually prevailed in Reformatory Schools. After Joseph's death in 1859, his brother Charles took on the management of the establishment, and was later succeeded by Joseph's own son, also called Joseph. A committee was eventually formed to oversee the School. The location of the School is shown on the 1927 map below. Stoke Farm Reformatory for Boys site, Bromsgrove, c.1927. Boys at the Reformatory were given classroom education and industrial training. 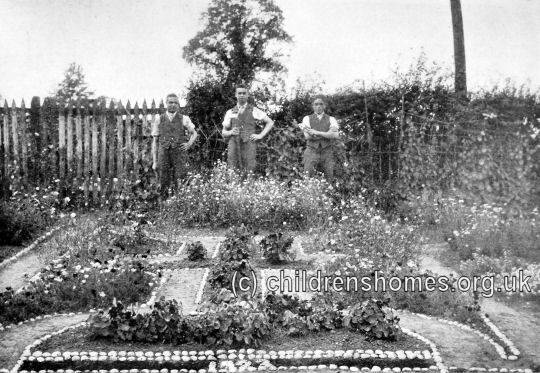 The boys were chiefly employed in agricultural work and gardening on the School's own 70 acre farm, and were sometimes also employed on neighbouring farms. Other trades in which training was provided included tailoring, carpentry and shoemaking. In 1866, the buildings were enlarged and rearranged. This provided a new dormitory, with workshops underneath, and a better playground. The old workshops were converted into a bakehouse and washroom. The number of places at the School was increased to 80 in 1905, and to 90 in 1908. Staffing was frequent problem at the establishment, particularly in the appointment of a resident school master. This probably accounted for the relatively high number of abscondments from the School in its early years. Stoke Farm suffered a major revolt in January 1903 when 60 of the inmates broke out of the institution at the end of their day's work. Most were recaptured by the next day. One of their number, Thomas Edwards, who had resisted arrest with a knife, was sentenced to six months' hard labour. Inmates.—Total number in school, 94; on licence, 43. Staff.—Superintendent and matron, Mr. and Mrs. J. Campbell. Deputy superintendent and head schoolmaster, Mr. A. E. Woodruff (ex p.t.). Assistant schoolmaster, Mr. W. A. Reynolds (ex p.t.). Farm bailiff, two gardeners, waggoner, shoemaker, tailor and drill instructor, visiting manual instructor, visiting gymnastic instructor, visiting bandmaster. Assistant matron, nurse. Medical officer, Dr. F. W. T. Coaker. Dentists. Dr. J. Westwood and Dr. A. Dixon Miller. Premises.—The premises are clean and in good order. 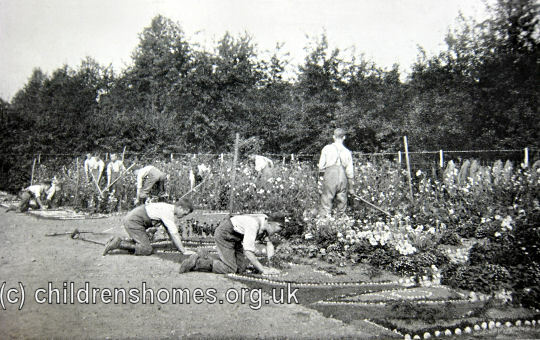 The boys' gardens, consisting of 27 double and 10 single plots, have provided a useful, interesting, and instructive occupation for their leisure hours. Both in cultivation and in originality of design there is an advance on former years, one boy gaining a first prize and two others certificates of merit in open competition. Some new instruments have been provided for the band. The gallery in the schoolroom has been repaired, and new desks are. shortly to be provided. New steam cooking apparatus has been fitted in the kitchen. Standards with awards.—Standard VI, 7, good; Standard V, 14, good; Standard IV, 30, good ; Standard III, 28, good; Standard II, 9, good; Standard I, 3, good (just); Preparatory, 3, of whom 2 are newcomers—all making satisfactory progress. The general award is good. The written work, with the exception of the weakness in spelling of newcomers, is both neat and accurate. Class subjects.—Singing—sol-fa, good. Composition, good —Standard III is above the average. Recitation. very fair in III, good elsewhere. Mental arithmetic, good. Tots are accurately worked. Geography, good. History readers are used above Standard I. Elementary science readers are used throughout the school, and form the basis of oral lessons on subjects connected with horticulture and agriculture. Industrial training.—Drawing is well taught in every class, and most of the work done in the books during the year and the tests worked at the annual inspection were above the average in accuracy and neatness of finish. Manual instruction in the use of woodworking tools continues to be satisfactory, but the work might be improved in accuracy and finish and extended in scope. The French gardening has been extended by additional frames, and provision has been made for the culture and study of 120 different varieties of herbaceous plants. Regular technical lessons have been given in tailoring, shoemaking, baking, care of live stock, and horticulture. Ten boys were presented for the Royal Horticulture Society's examination. All passed and one gained a first-class certificate in the senior division and won £50 scholarship. Four boys entered the Seaman's Cookery School, and after a month's training went to sea as assistant stewards. The fife and drum band of 18 members is making good progress. The Army class has again been very successful, the examiner reporting very favourably on the results. 84 boys in the school are 14 years of age or older, and practically all are receiving regular training in skilled industrial work. 31 boys left during the year, of whom 28 entered skilled or progressive callings. The school found 22 of the situations. Physical training, &c.—Free exercises and military drill, including company movements, rifle drill, and semaphore signalling, have been taught. The school has been successful in athletic competitions, gaining cups and medals for flat-racing, air gun firing, football and swimming. There have been monthly concerts during the winter and several outings in the summer. Health. The medical officer visits weekly and examines and reports quarterly. A boy died in July at Bromsgrove Hospital of abscess on the brain, and another is subject to epileptic fits. Two boys have suffered from rheumatism and one from tonsilitis, but are recovering. There have been a few cases of skin disease and glandular affections, but otherwise the health has caused little anxiety. The dentists visit monthly; oftener, if required. Conduct—No serious offences have had to be recorded against the boys. The mark system, with monetary rewards, has continued to prove effective, and the tone of the school is very good. General remarks.—The boys of this school get a really useful training in fruit farming and market gardening. These departments are skilfully organised and the technical instruction in connection with them is of a high order. Army class work continues to be successful. 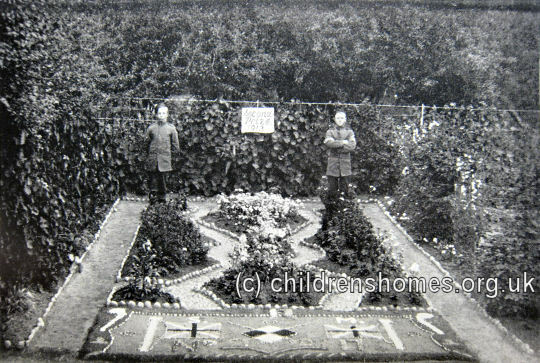 As noted in the above report, boys had their own flower garden plots, with an annual competition being held for the best. Some of their efforts are illustrated below. The School was closed in 1925. The site is now the privately owned Ryefields Farm. None of the original buildings is thought to survive.